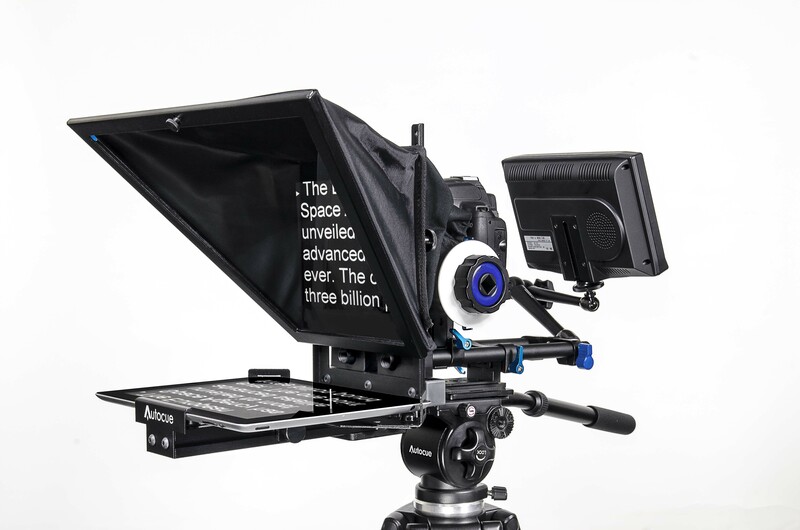 How to use a Teleprompter properly? A quick guide. What is a Teleprompter used for? A teleprompter is a device that displays ‘prompts’ or ‘lines of speech’ to the speaker. It is placed below the level of the camera so that it is not captured on film, but still remains visible to the speaker. It is extremely helpful when the subject needs to read out lines from a script and the content is too large to be memorized. The subject needs to be looking straight into the camera and not elsewhere. So it is important that the lines are displayed to him/her as he/she does this. Before shooting, it is important to be familiar with the teleprompter. There is a software which scrolls the text down as you progress through the lines – and this is controlled by a scroller in your hand. Practice makes perfect: If you rush through the lines, the software also does the same. Altogether, this makes for a bad video recording if you appear ‘hurried’.The best way is to use your natural tone and rate of speech, as if you were talking to a colleague or friend. Improvise: There may be some words in the script that are not compatible with the way you naturally speak. Feel free to substitute, say ‘utilize’ with ‘use’. The teleprompter will stop scrolling (it is controlled by you) and you can pick up from where you left off, i.e. the word after utilize. Practicing with the teleprompter beforehand is a good idea, because that will help you ‘iron out the chinks’. For instance, if 911 is displayed on the screen, do you pronounce it as ‘nine hundred and eleven’ or ‘nine one one’? That would depend on the context, and overcoming this hurdle before going ‘live’ is better than trying to tackle it in the midst of your speech. If you realize later that you made a mistake, as would become evident from the rest of the words that follow (these wouldn’t be displayed at first), you might become nervous and that has a telling effect on delivery. To feel the most comfortable, practice at the location where they will be filming you. Change the script if required: Remember, the teleprompter displays a script. This might be written by you, or by someone else. Either way, speaking is different from writing.For example, the Prime Minister of Sri Lanka, a small country in Asia, is Ranil Wickremesinghe. This might appear on the teleprompter, but how do you pronounce it correctly if it is the first time you are hearing of the name? Do you pronounce the first name as ‘Raneel’ or ‘Ranyl’? How exactly is the second name to be pronounced?This is why you need to go through the script or use the teleprompter and make the necessary changes. You could change the words to how they are to be pronounced, such as ‘Ra-nil Vic-rama-sing-eh’ and thereby expect a better delivery when you are shooting live.It is easy to miss punctuation marks on the teleprompter. A period is but a small dot. So it is recommended that you use a double carriage return in between sentences. This will clearly tell you when one sentence ends and the next one begins. Missing a comma or semicolon is minor compared to missing a period – this kind of delivery leaves viewers/listeners all confused. If you need to pause (this is the speech equivalent of a comma, which separates ideas in a sentence), have [PAUSE] instead of the punctuation mark.If an all-caps text makes it easier to read, make the necessary changes to the text. Customize the teleprompter according to your preferences: Because it is a software that is being used, you can choose the background color, foreground color, font size and font type so that you are comfortable reading off it. It would be awkward if you used person’s settings and had to strain your eyes to better understand what was being displayed – the video camera is recording you and all your facial expressions in close-up! Smile, and use body language: It is going to become apparent that you are using a teleprompter if you remain rigid and deliver a monotonous monologue. Smile – this puts your viewers at ease and enables more of a ‘connect’, and use your hands (although this shouldn’t seem like a deliberate attempt at breaking the monotony). Above all, don’t panic: If you fumble with the scroller, go off script. You would know the context of the speech, and it shouldn’t be hard to paraphrase something you said earlier, while you try to get back on track. iOS apps (you need an iPhone/iPad for these) include iPrompt Pro, Prompterous, Prompster Pro–Public Speaking App, iCue and Teleprompt +3. These are great by themselves and do away with the need for a teleprompter – perfect if you don’t have access to one. They convert the iPhone/Pad screen into a teleprompter screen, and you needn’t hold them in your hand – they can be mounted on a tripod and placed below the level of the camera. If you are recording using the same device, it is perfect – what more do you need? Another iOS device controls the speeds of the teleprompter app. Learn how to produce an entertaining, professional Morning News Show at your school! 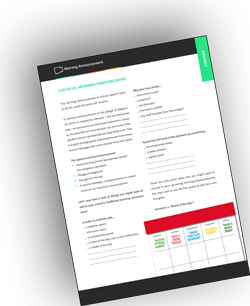 Download our FREE Morning Announcement Checklist! Your school's morning announcement doesn't have to be the same old routine everyday!